But I felt that there was a gap between these offerings—Pdb being very austere, and Winpdb and the IDEs being rather heavyweight. 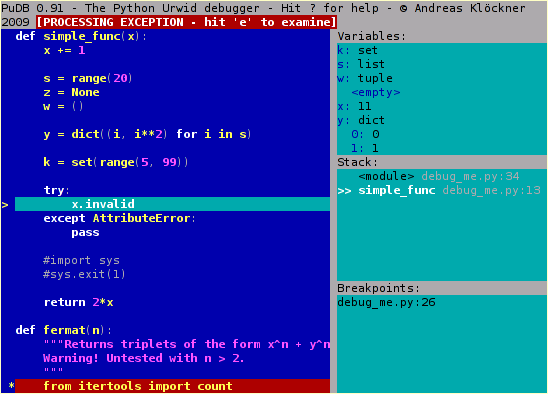 I wanted a comfortable debugger that’s easily usable in a shell and doesn’t require me to touch my mouse. PuDB uses Ian Ward’s excellent Urwid library for its interaction with the console. Update: Looks like PuDB is slowly growing a community. There’s now a mailing list to host discussions.